"We have all become #TylerStrong. To his family, words can’t express how sorry we are that he has passed." 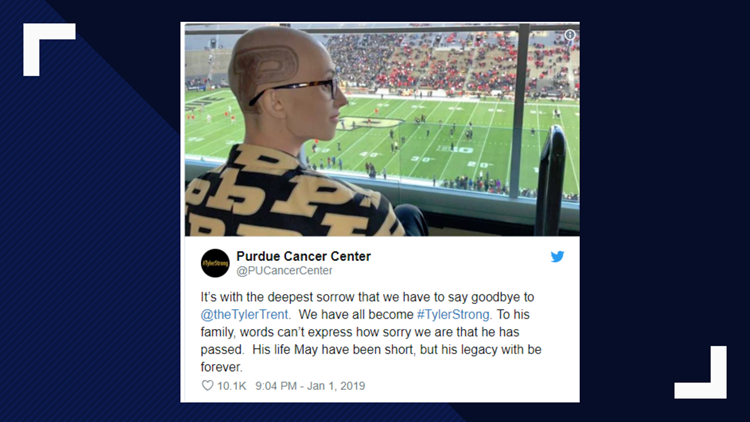 WEST LAFAYETTE, IN (WSMV) - Tyler Trent, a former Purdue student and superfan who was celebrated at the Music City Bowl game has died, according to Purdue Cancer Center. The 20-year-old former Purdue student and Boilermaker super fan was flown in to Nashville days before the game Friday by Indianapolis Colts owner Jim Irsay so he could be at the center of the field for the coin toss with the Purdue and Auburn team captains. Moments before the coin toss Purdue football players could be heard telling Tyler “we love you.” He responded with "kick their butts." Learn more about Tyler's story and find ways to donate to support cancer research here. You can also donate to Purdue's Tyler Trent Campaign here.